The best wrinkle cream mixed with vitamin C cream creates a high end facial moisturizer. I do not use this alone. mixed with vitamin c cream it makes one of the best high end creams on the market. I have gotten rid of all my dark spots on my face and reduced the wrinkles around my mouth from being a previous smoker, as well as my crows feet and smaller wrinkles. 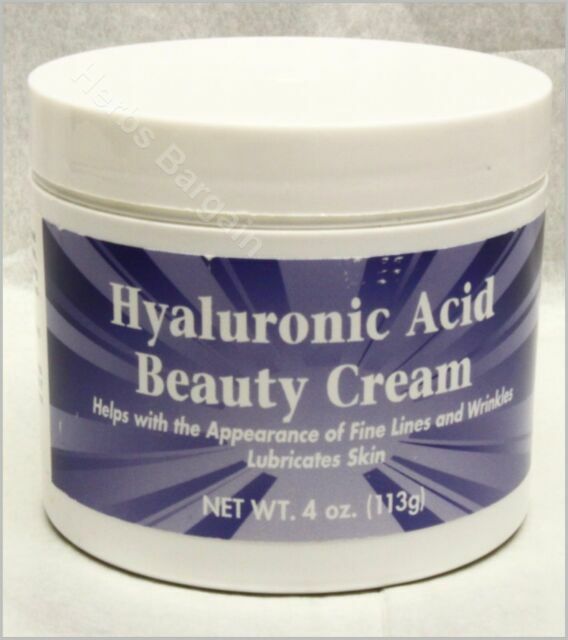 I have gotten many compliments on my skin and it is because of thins Hyaluronic Acid cream and Vitamin C cream. Wonderful. This is an excellent beauty cream which smooths and hydrates the skin. I love the way it feels when it goes on as it has a cool feel to the skin. It is not greasy at all, and makeup glides over it easily. I like how it fills in the tiny lines around the eye area, too. I would highly recommend this wonderful beauty cream which is offered for a great price. I have had a lifetime of very sensitive skin. I am now 61 and have to still use benzol peroxide products on some areas of my face while starting to battle wrinkles.. This product softens skin, plumps it and helps lessen wrinkles. I love it. Bought an expensive jar of it at Walmart. Then found this brand. Very economical and now I can use it on my whole body. Best skin lotion I have ever used! I use this mainly as a night cream, but when I have excess dryness I apply a bit of this and my skin is cured. I have very sensitive skin that is either producing too much sebum or is dry and always acne prone. It's so creamy but almost fluffy and melts into skin. I've noticed a major difference in my fine lines and also improved elasticity in my face and neck that I can't imagine using anything else now. Definitely better as a night cream but it's a little heavy to wear under makeup. So soothing when slathered on a fresh face at night. Highly recommend! So far--so good! I can already tell a difference in my neck and face! Just put it on in the morning on a clean face--before makeup, and then at night put it on a clean face--before going to bed. It won't be long until you can tell the difference too! I'm sold on this!